Cherry Valley Estates is ideally suited to families and retirees seeking more space, a more elegant home or both. 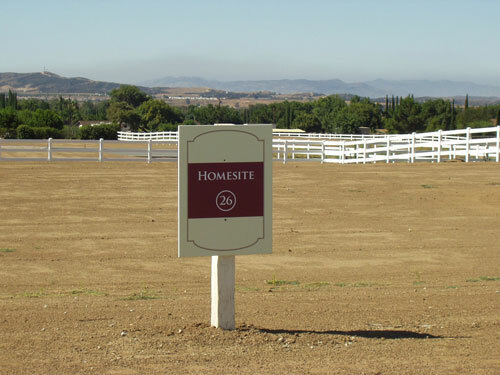 Each homesite will include underground utilities (electricity, gas, telephone and cable), a water meter, and side yard fencing. The home you build at Cherry Valley Estates will be governed by a neighborhood friendly Covenants, Conditions and Restrictions (CC&R's). The CC&R's have a minimum house size of 2000 square feet and no mobile homes will be permitted. Cherry Valley Estates has no Mello Roos, no Community Facility District (CFD), and no Home Owner's Association (HOA) and the Tax Rate is just a little over one percent. School fees will be paid on the Homesites we have released for sale so no other school fees will be due (these typically run $3 to $4 per square foot of new construction or more). Water meters are already in place and paid for and concrete curb and gutter has been installed in the streets along with white three rail fencing for the lots released for sale. © 2018 Cherry Valley Estates, All rights reserved Website by GARDEN OF E.